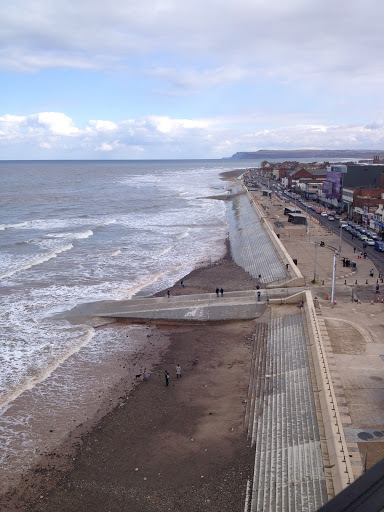 Gosh, I can’t believe how long it’s been since I’ve blogged, this Easter half term has just taken away all of my time. I think I should really learn how to do this on my phone or iPad as I’m terrible for getting the laptop out. Anyway, it’s been a busy busy time here at Casa Kitsch Stitch as it’s half term and not only do I have Roux and Hurricane but I’ve also got my niece and nephew for the next two weeks. It’s quite hectic, noisy and FULL ON with a 6 year old, 5 year old, 4 year old and 2 year old. Lots of fun though. The weekend got off to an amazing start when I got to meet my peanut for the last time before he/she arrives. The scan was wonderful, it’s the best I’ve ever had, the sonographer kept the monitor at me the whole time and talked me through each measurement. She was an absolute darling and made me feel happy and relaxed, she almost seemed to share my excitement and clearly adores her job. When it came to checking the heart she put colour onto the scan so one side was beating in red and the other blue. It was breathtaking. I had my parents and Roux with me and we all had fun counting fingers and toes. 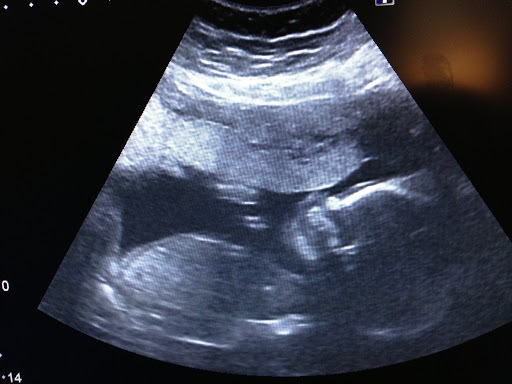 The sonographer had a good look at Peanuts parts and could tell me whether I’d be having another boy or girl. Unfortunately, at the moment I can’t share but I can say I’m very, very happy with what I’m getting. Here is a grainy picture of a picture – I think I might do a little sweep of gender and weight and have a prize for one of my followers. 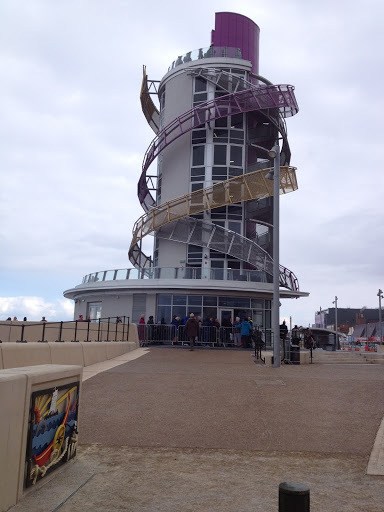 My home town and the where I should be returning to soon has opened a tower Vertical Pier called the Beacon, it’s umm, interesting and looks like a bit of a Helter Skelter. 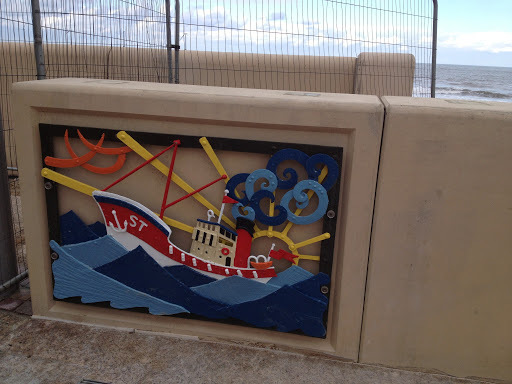 I’m really not sure about it but it’s definitely caused some consternation in the town as it’s cost a lot of money had has had a lot of problems. 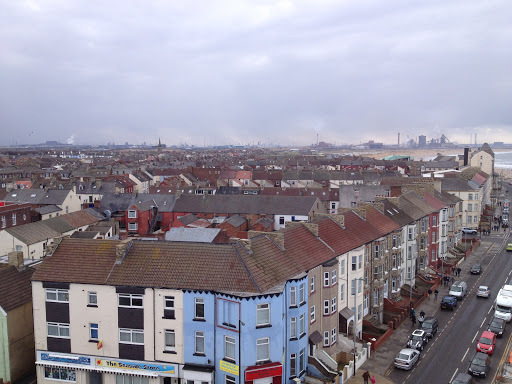 It’s also a bit of an eyesore but is the start of a huge regeneration project in the town so I’m hoping for good things. It was officially opening Easter Weekend and the celebrations were supposed to start on the Friday. We dragged the children out promising them a funfair, rides and lots of fun things. What we actually got? Biting wind, no rides and snow! 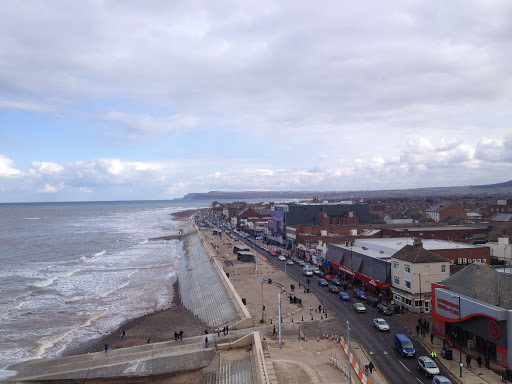 It was freezing and not a very nice experience, turns out that although the Beacon was open, nothing else was so we had a quick trip up to the top then ran back to the car to go and get warm again. The Helter Skelter or Vertical Pier. 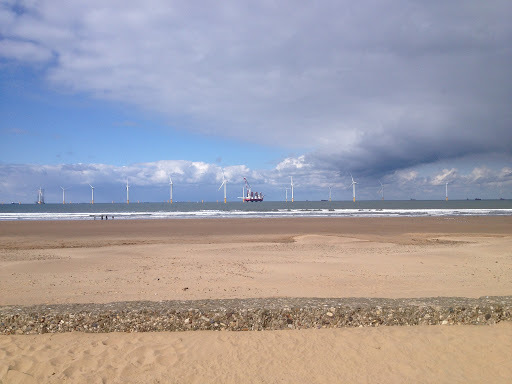 Not such a pretty beach as where I live now, they’re building a wind farm as you can see. Roux is fascinated by it all and often wants his binoculars so he can get a better look. 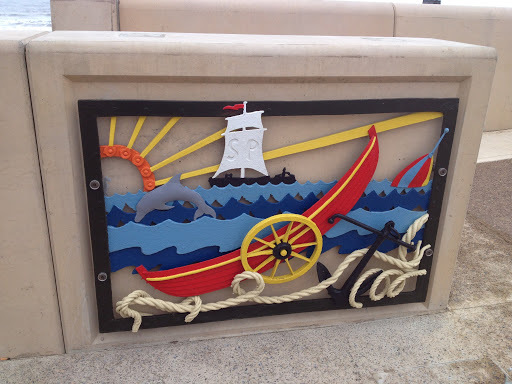 An example of the lovely artwork that adorns the whole seafront. I think these are my favourite things about what they are doing along there. I’ve had lots of fun games with the children spotting all the things in them. On Saturday we went back and the town had a small market, lots of rides and we had such a fun packed day. We ended up staying out so long that we went to a restuarant for something to eat and Roux had an ice cream the size of his head! Easter here was very lovely, Roux and Hurricane had received quite a few Easter Eggs that they might need help eating so I didn’t want to buy any more. 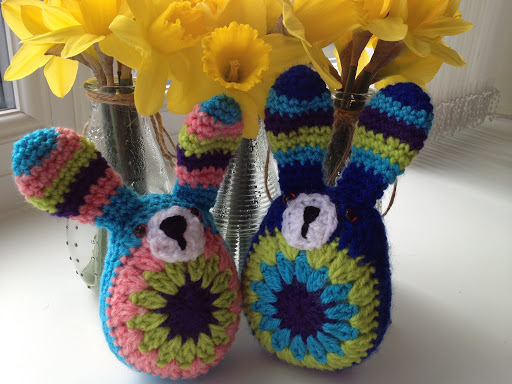 Instead, the two of them woke to Easter Bunnies courtesy of a pattern found on the lovely Green Dragonfly blog. Roux especially was ecstatic! I think nursery have been discussing the Easter Bunny as he’s been acting like he’s the same as Father Christmas and he truly believed that the Easter Bunny had delivered his rabbit to him – good job I made them while he was in bed I suppose. Very soon after opening that we travelled further up North to see some wonderful friends who had briefly returned from Cyprus to hold their daughters Christening. It was a 3 hour round trip and proved to me just how hard life as a single mother can be at these sorts of events. The after do was held in an upstairs room of a social club and trying to keep my eyes on both children as they climbed onto the stage, tried to escape, drink other peoples dregs, fight, run away etc was exhausting. Even a trip to the toilet meant I had to take both of them as if I went on my own leaving someone to watch them the little blighters just followed me and being that it was so close to the stairs and the way out I couldn’t take the risk. As much as I really enjoyed the day I was so glad to get back home and put them to bed. The rest of the week was spent cooped up at soft plays, the library, the house and having play dates at other peoples as the weather has been so bad. 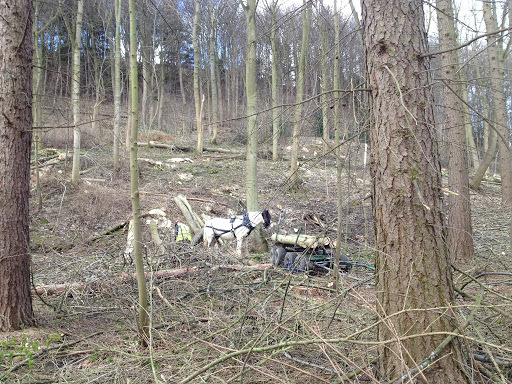 After days of this we got so fed up we had to go somewhere so took a trip to a local woodland. The hail stones started as we arrived *roll eyes* and I did wonder if we were doing the right thing but they cleared up and running around the woods certainly warmed us up. It’s got lots of tracks that are full of wooden gym equipment and carved animals, the children had lots of fun jumping on them and demanding photographs. Plus collecting twigs and leaves and trying to carry heavy logs. We came across a logger using a beautiful working horse to help him load them onto a wagon. We spent quite a while watching them work together but I didn’t want to get too close, I do wish that my DSLR wasn’t missing in action so I could have got a better picture. Hope you had a wonderful Easter, I’ve been reading so many blogs of all the fun things people have gotten up to, I should have put more thought into this and had some links ready. Next time, always next time.